Last week, six Pacific Ridge students joined Mr. Betzala, Ms. Capozzoli, Dr. Rosenwong and Dr. Smith at the 2015 Student Diversity Leadership Conference in Tampa. 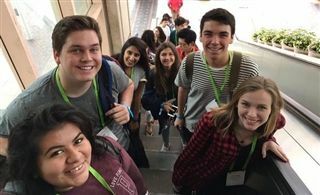 The conference, sponsored by the National Association of Independent Schools, is a gathering for upper school student leaders to examine issues of diversity on high school campuses. This year's theme was "Learning to Listen and Listening to Learn: The Art of Dialogue and The Science of Living Justly." Students developed cross-cultural communication skills, participated in self-reflection and community building activities, and gained a better understanding of effective strategies for social justice.